PITTSBURGH (AP) Ben Roethlisberger wore sweatpants and tried to stay warm. Le’Veon Bell and Cam Heyward too. 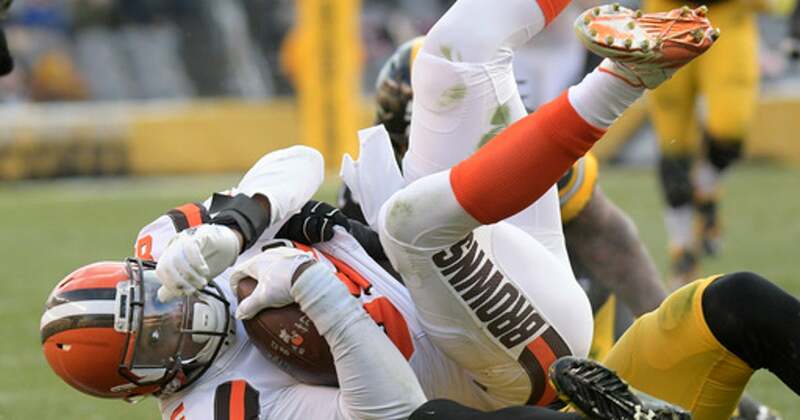 All three were given the day off by Pittsburgh Steelers coach Mike Tomlin, who opted to rest his stars for the playoffs rather than put them at risk against the winless Cleveland Browns. Besides, Tomlin had little doubt the 45 guys who suited up could handle the Browns anyway. ”I felt completely confident in terms of the guys that we played with today in terms of their ability to do the job,” Tomlin said. Landry Jones completed 23 of 27 passes for 239 yards with a touchdown and an interception, running back Stevan Ridley ran for his first score in three years and rookie wide receiver JuJu Smith-Schuster wrapped up an impressive season by catching a touchdown pass and returning a kickoff for another score and the AFC North champions never trailed in a 28-24 victory on Sunday. The Steelers (13-3) went a perfect 6-0 against the AFC North while wrapping up their third division title in four years. They did it by sacking Cleveland rookie DeShone Kizer six times to boost their season total to a franchise-best 56. They did it by relying on Smith-Schuster’s remarkable playmaking and the evolution of Jones from raw prospect to competent backup. It’s a journey Jones is hardly taking for granted. ”I sat around this place for five years preparing for moments like this,” said Jones, who beat the Browns in the finale for a second straight season. Jones will return to his spot on the sideline when the Steelers open the playoffs in two weeks as the second seed in the AFC. Smith-Schuster, however, will play a pivotal role in Pittsburgh’s attempt to get back to the Super Bowl for the first time in seven years. If anything, the 21-year-old is getting stronger as the weeks go by. He finished with 265 total yards and the two scores. Smith-Schuster’s 917 yards receiving on the season set a rookie record and his 58 receptions are the second-most in team history by a first-year player. The Steelers have struggled in their return game all season. Then Smith-Schuster fielded a kickoff at the Steelers 4 immediately after the Browns tied the game at 21. Twelve seconds and 96 yards later, he collapsed in the end zone and did a snow angel in the 11-degree chill as teammates prepared to dump snow on him. Smith-Schuster easily juked Cleveland kicker Zane Gonzalez then stiff-armed Cleveland defensive back Justin Currie to complete Pittsburgh’s first kickoff return for a touchdown since Antonio Brown did it as a rookie in 2010. Things ended up working out pretty well for Brown. Smith-Schuster isn’t naive enough to put himself in that group, but still, it’s been a pretty solid start. If you get on the field, you better be able to produce. The proof came over three-plus hours at frigid Heinz Field when Pittsburgh triumphed even with so many bold-faced names on the inactive list, at least for a day.